When Douglas Scott founded Full Radius Dance in 1998, he was motivated by a partnership with the Shepherd Center and the unique power he discovered in the effort to defy the limitations of the human body. The exploration of dance techniques for aspiring artists with disabilities inspired Scott to create a space for them to express themselves freely despite physical limitations. Full Radius Dance premiered Tapestry at 7 Stages in Little Five Points over the weekend. The hour-length work, choreographed by Scott, featured The Urban Youth Harp Ensemble and invited audiences to explore the boundaries of storytelling, inspired by the tapestries of medieval France and Madagascar. The evening began with a prologue performed by Shawn Evangelista, Mason Diaz and Demarco Sleeper. Paying careful attention to the hands and fingers, all three dancers carefully wove each other’s bodies into the choreography. Moving in between, over and under each other, they created the illusion of a human tapestry in the making. This short piece set the tone for the rest of the night, preparing audiences to witness the marriage of artist, medium and music. At the inception of “The Spider Tapestry,” a piece inspired by a golden tapestry woven with the silk of the Golden Orb-Weaving Spider, dancers entered the stage, accompanied by musicians of The Urban Youth Harp Ensemble. Breaking the distance between dancer and musician, Diaz interacted with harp players and their instruments. He danced between the ensemble to demonstrate multiple art forms coming together to create together. In another representation of unity, Diaz approached the tapestry on display and touched it. Unlike a traditional museum setting where the tapestry would be protected by a glass case, this setting exposed the work, allowing dancers to feel its texture as they performed. Serving as real-time inspiration, the dancers embraced the golden beauty of the tapestry and made careful, caring physical contact as if imitating the smoothness of silk. In contrast to Scott’s delicate choreography and the elegant performance by the musicians, the piece that followed, “The Apocalypse Tapestries,” was combative and intense, opening with a battle scene inspired by a 14th-century French tapestry. The beautifully composed fight between Sleeper and the other male dancers was reminiscent of Brazil’s Capoeira — the Afro-Brazilian martial art that combines elements of dance, acrobatics and music — because of its intricacy and athleticism. This piece revealed every dancer’s strength through partner work as each dancer, abled and disabled, transitioned from the floor upward, and vice versa. 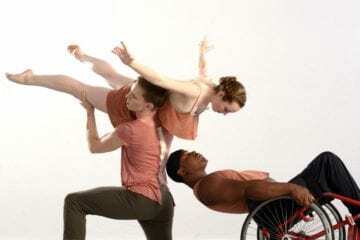 Throughout the piece, the dancers in wheelchairs were not afraid to lean to one side while balancing on one wheel. They supported each other like a group of soldiers in combat. If anyone thought that dancers in wheelchairs were limited to the use of their arms and heads, this piece destroyed that notion completely. Ending the night was a piece inspired by medieval tapestries that celebrate the beauty of a unicorn. Laurel Lawson played the role of the mystical creature and captured the essence of the unicorn. She drew in the audience through the intensity in her gaze and the elegance in her upper body and even the tilt of her head. Partnering with multiple dancers throughout the piece, Lawson was fearless in carrying them as they leaned away from her or tilted her chair so far that she balanced on a single wheel. Her ability to transition from the ground to standing position, and from being partnered to partnering someone, was effortless. Lawson bravely embodied the purest example of artistic freedom. Throughout the evening, the dancers displayed care as they transitioned from one partner to another and from one movement to another. Their connection demonstrated the unique power Scott discovered when delving into physical integration. No matter how different each body was, the company celebrated their various abilities by creating an unbreakable union through art.